Bromine (Br) has not been officially designated to be essential for humans at this time, however there have been reports of reduced growth, fertility, and life expectancy in some animals as a result of hyperthyroidism secondary to dietary deficiency of bromide. In humans and animals, Bromine - either as Sodium Bromide, or Potassium Bromide - has anti-seizure properties, and it is an effective trace mineral in the treatment of hyperthyroid conditions. Many marine plants, particularly kelp, are a rich source of bromine and iodine, so depending on their bromine to iodine ratio, and whether someone is hypothyroid or hyperthyroid, this can have a beneficial or unfavorable effect on thyroid functions when regularly consumed. When reports of hypothyroidism cases surfaced as a result of certain cultures regularly consuming seaweed (such as Kelp), some researchers believed the high iodine content in those marine plants to be the reason. However, it was most likely the bromine content, or a high bromine / iodine ratio in the plants compared to those of other regions, or that these same people possibly also consumed higher amounts of "goitrogenic" vegetables such as lima beans, cassava, cabbage, sweet potatoes, rutabaga, which can result in depressed iodine / thyroid functions. On average, most varieties of kelp tend to increase thyroid functions. In hyperthyroidism, where milder forms of nutritional therapy such as PABA or magnesium have not been very effective, Dr. Ronald Roth had seen bromine to be very effective in human and animal applications, and provided the proper amount is used, no side effects are experienced. Bromine inhibits both, T4 thyroxine and T3 triiodothyronine hormones, and in some cases only a short course of bromine is needed to return (hyper) thyroid functions back to normal. (see also "Tin & Iodine"). Bromides can still be found in some medications, and despite a ban on potassium bromate in flour by the World Health Organization (it was found that potassium bromate caused renal cancer in rats when they drank water containing KBrO3), some nations are still allowing its use as oxidizer in baked goods at very low levels. Bakers associations maintain that potassium bromate is converted to harmless potassium bromide during the baking process. 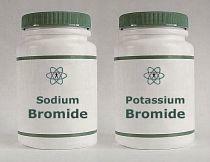 Bromine was also used as a sleeping aid in the past, for which it worked well, however long-term use of bromides can result in brominism, a toxic condition. In addition, even trace amounts of bromine can trigger severe acne in sensitive individuals. Bromine-based Fire Retardants  used in carpets, mattresses, upholstery, furniture and various electronic equipment have become suspect for causing a number of medical conditions, including hypothyroidism. Based on animal research, bromides have also been linked to behavioral problems, neurodevelopment and attention deficit hyperactivity disorders (ADD / ADHD) in children. The European Union has already banned some PBDE (polybrominated diphenyl ethers) compounds, and it is hoped that countries still allowing their use will follow suit. While Phenobarbital is the conventional approach in Veterinary Medicine to control seizures  in dogs, some veterinary doctors started experimenting with bromides some years ago. At first, they were used for resistant cases, but now there are a large number of vets who are not opposed to using either potassium bromide, or sodium bromide as a first choice over phenobarbital. Estimated median daily intake of bromine worldwide from food and water is 2mg - 5mg / day. High Bromine: Poor memory, possible attention deficit / hyperactivity disorder (ADD / ADHD) in children, drowsiness, fatigue, nausea, vomiting, acne, skin rash, blurred vision, dizziness, mania, pancreatitis, hallucinations, increased thirst, hunger and urination, muscle weakness, hypothyroidism, psychosis, coma.